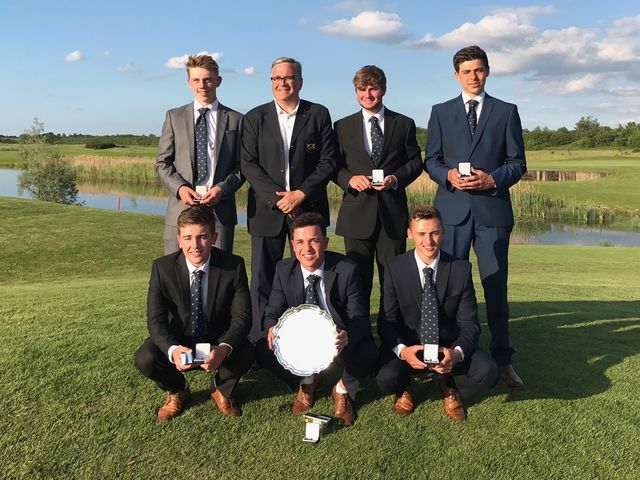 Staffordshire Boys will represent the Midland Region in the England Golf Boys County Finals at Northamptonshire County Golf Club in August. Finishing on 724 they edged out Nottinghamshire maintaining the slender lead from the morning round. Nottinghamshire were unable to reduce the deficit and finished just 3 shots further back on 727. Northamptonshire were hoping to secure a place in the finals for a third time and the advantage of a home course but finished a disappointed third 16 shots behind Staffordshire on 740. Lincolnshire and Warwickshire took 4th and 5th place respectively with 741 and 742. George Clarke of Druids Heath Golf Club had an impressive 5 under Par total of 139 to head the field individually securing the Arnold Quaish and earning a place in the English Boys U18 Open Amateur Stroke Play Championship (Carris Trophy) at West Sussex Golf Club on 25th to 28th July. Matthew Freeman (The Notts Golf Club) and Charles Petrie (Luffenham Heath Golf Club) were tied second on 141. Josh Davenport (Maxstoke Park Golf Club) and Liam McNeela (Collingtree Park Golf Club) shared 4th place on 142. Charles Petrie (Luffenham Heath) recorded the best gross score from the first round with a 67 to qualify for the Telegraph Vitality Junior Golf Championship and William Saville (Holme Hall) had the best nett score of 65 to qualify for the same event. Both players will be entered onto the national leader board and are hoping to be one of 9 players to compete in Quinta Do Lago in November.